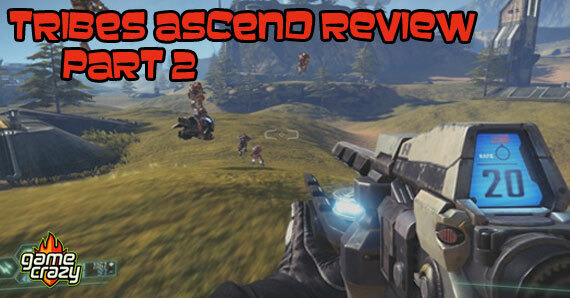 Last week was Part 1 of my detailed review for new free to play Tribes Ascend. 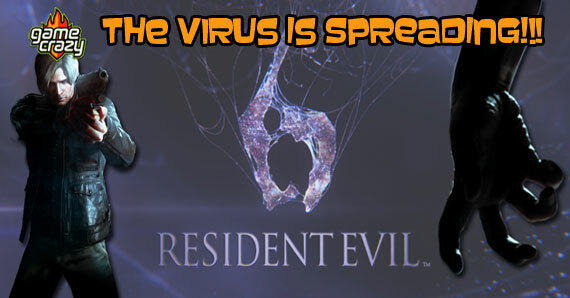 So let me get right to it and continue my dissection of this epic game. Let me remind everyone that this review is based on over 20 hours of playing the final/non-beta version of Tribes Ascend. There’s not much out there for vehicles. You’re stuck with a fast hover cycle, a hover tank, or fighter plane. 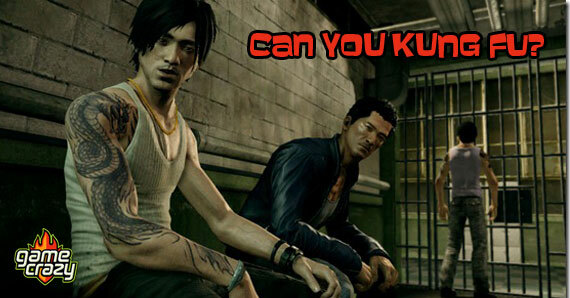 The main issue here is that you can’t damage them with machine guns, which is the most common weapon in the game. And even with spinfusor, it takes a lot to kill a tank and impossible to hit the fast moving cycle or fighter. The good news is that the Doombringer Armor Class is equipped with a missile launcher to take out these pesky vehicles. The bad news is that it doesn’t work very well. The missile isn’t very fast or smart so it’s easy for the missile to hit the side of hill, eve after lock-on… and the required 3-second required lock-on is nigh impossible to get against the cycle or fighter since a single hill or passing opponent with abort your lock-on attempt. The slow moving hover tank is easy to lock onto, but your missile is oftentimes destroyed by the mounted machine gun, not to mention it takes alot of them to destroy that tank (and again, the tank simply needs to walk over a hill and the missile will likely hit the hill instead). 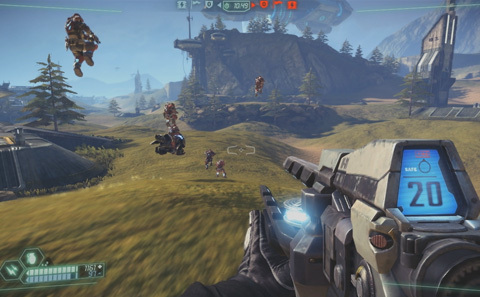 Again, the Tribes: Ascend focus is very much on offense, and vehicles are no exception. While these vehicles are inferior to those found in Tribes 1 and Tribes 2, it is a marginal step up from Tribes: Vengeance, which saves this review from giving it a D grade. 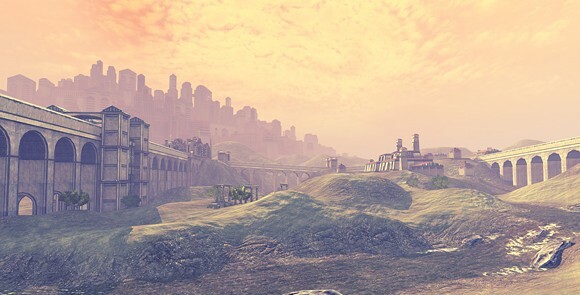 The weapons of Tribes: Ascend are mostly the same as the previous games with some notable exceptions. Machine guns get a huge boost here. Rather than having a standard chain gun as the original series, there are least 3 types of machine guns that are equipped on various armor classes, and it works for the most part. Machine gun combat is far more interesting here than in previous games since they now have ammo clips — each machine gun needs to be reloaded with a new clip (automatically) when your run out of bullets, which adds a completely new dimension to Tribes (in old Tribes, you had lots of ammo in your chain gun without ever needing to reload). Running out of ammo is rarely a problem, and finding ammo is easy since each kill causes the deceased to drop some ammo. The new machine gun focus is a good feature for Tribes: Ascend, as it brings machine guns into the foreground and makes it on par with the other standard Tribes weapons (the massive mortar, the awesome spinfuser, and the grenade launcher), but on the other hand it reinforces the over emphasis on offense. It’s very easy to get away while your opponent is reloading, so defense is pretty terrible. On the other hand, pistols and variable damage spinfusers are very welcome addition to the game, and there’s something extremely satisfying about launching mortars from thousands of feet away… even if there’s nothing to hit. Unfortunately you’re locked into the weapons of your class. While you can unlock other weapons within that class, death only forces you to drop ammo, not your weapon. In the previous Tribes could swap your machine gun out for a spinfuser you find on the ground, but you can’t do that in Tribes Ascend at all. You’re locked in from the moment you spawn, which is an unwelcome change from the original Tribes. The Technician suffers the most from this atrocity, as it’s stuck with just 1 weapon and 1 repair “gun”. Tribes: Ascend suffers from some very poor map choices. While the game is indeed about wide-open-spaces, this doesn’t work as well as in Tribes 1 and Tribes 2 due to the lack of true transports. There was a certain magic in the original tribes when someone flew an APC to the enemy base carrying 4 Heavy Armors, and something equally as magical when your team shot it down. With maps so wide open and you have to walk (or fly) everywhere, and it makes it feel like a chore. You literally spend most of your time traveling from place to place rather than trying to win the game. It’s just too bad. This isn’t bad for fast light classes though, since you’re flying at the speed of light, but heavier classes are pretty much screwed in this respect. Once again, the game is very much focused on the fast offensive game, which ruins any sense of balance that Tribes 1 and Tribes 2 achieved. Overall I’d say the maps are better than average since they fit the theme of “Tribes” very well. But the game is sorely missing indoor intricate maps, and lacking any real gems like the original “Rollercoaster” map or the custom “Tiny Avengers” map from the original Tribes. The original Starsiege Tribes and Tribes 2 had a robust modding feature. While Tribes focused on custom scripts for skiiing and verbal commands, Tribes 2 took it a step further allowed for some great custom skins (I should know, I created the widely used Superman, Green Lantern, and Punisher skins). Sadly, there is nothing of the sort in Tribes: Ascend. And it looks there there are no plans to allow any modding at all. This doesn’t hurt my final review of Tribes: Ascend at all, but it is important to take note since modding was such a big deal in previous games. 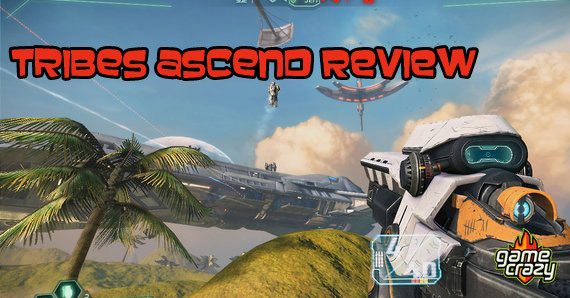 Unlike previous incarnations, Tribes: Ascend is free to play, and it does a fairly good job at it in some respects. You start out with the fast Infiltrator class and gain XP — XP is used like currency to unlock other classes or upgrade weapons. Best of all, you get XP for almost everything you do! Damage an opponent before someone else kills him? You’ll get bonus XP for that. Repair a generator? 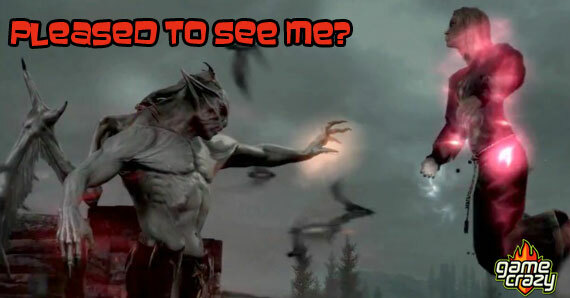 You’ll get bonus XP for that. Your deployed turret gets a kill? You’ll get XP for that. Won a match for the first time today? You’ll get bonus XP for that (a great way to encourage playing at least once per day). The main problem is “Base XP” vs “Bonus XP”. Your “Base XP” is generated by being in the game. That’s it. So you could literally stand around and do absolutely nothing and gain 95% of your XP. The other 5% comes from “Bonus XP” mentioned above. And even worse, the majority of bonus XP is awarded for getting kills. You could literally spend the entire match repairing your generators, turrets, and sensors, but you won’t get nearly as much bonus XP as someone who got just a handful of kills — once again, you get awarded for offense, which gives teammates little reason to repair the base or defend the flag. I think I got some 500 XP for playing 10 minutes and about 50 bonus XP for killing 6 enemies or so. It’s very upsetting when you realize you spent most of the game repairing stuff for your team got almost nothing for it. XP isn’t the only way to unlock things — to get stuff quicker you can spend real money to buy “Tribes Gold points”. Or if you can refer people to the game, you’ll get bonus XP to upgrade more stuff (unfortunately they need to get to level 6 for you to get the reward, which takes several hours to do). While the Free to Play model works well for Tribes Ascend, the offensive nature of the game often makes it a waste to spend Gold/XP on those heavier classes. And the Gold you purchase can only be used to unlock weapons and classes — to upgrade those weapons you need XP to do that (rather than Gold). This isn’t necessarily a bad thing as it means you can’t just buy your way to the top. But at the same time you have to pay special attention to how much gold you buy. Unlike Microsoft X-Box points, Tribes gold is only good for Tribes, so having left over gold is a waste of money. There is one serious flaw in the XP system: quitting a match forfeits all your XP. So if you’ve been playing an intense match for 20 minutes, but need to quit because your child pooped his pants (a scenario this reviewer ran into several times), then you won’t get any XP at all from those 20 minutes of play. This means you’re pretty much locked into any match you start, and sometimes a match can go on for a long time. It’s puzzling that Hi-Rez developed reward system that encourages being in the game (and doing nothing), but then ruin it by removing all those rewards if you have to leave a match for any reason. It’s a serious problem that punishes casual players. The game does a good job with its basic tutorials on flying, skiiing, and shooting, but that’s about it. Five minutes later and you’re on your own to fight against players that are ten times better than you. The Tribes franchise has always had a high learning curve, and jumping into your first fight is overwhelming in this regard. There are lots of things that are completely unexplained, like “how do you jump out of a vehicle” or “why did my deployed turret disappear when I changed my armor”. There is a series of help boxes that come up for important things (like “how to upgrade the sensors”), but everything else is by trial and error only. The fact that there is a fast tutorial prevents from section from getting a grade of F, but after 3 incarnation of Tribes you’d think programmers would be clever enough to find a way and help out newbies by now. As it stands, this lack of hand-holding is going to make most non-Tribes players quit the game… and never come back. The game is gorgeous on high detail, thanks to the Unreal Engine and some good computer artists and modelers. The problem is getting to that level. Even with a decent graphics card and a 6 core CPU, my rig struggles unless I keep the graphics on “Low”. I know the game is gorgeous because I’ve seen game video of it, but I’ve never actually seen it on my own PC. Unlike other 3d games, Tribes: Ascend has a pitiful number of graphics settings. I can’t turn off weather effects, water reflections, shadows, or anything like that. Without the ability to tweak settings, you’re stuck with a simple “low/medium/high/” setting, which is too bad since most games provide much more. It certainly doesn’t help the weapons take up a full 1/5 of the viewing screen… which is a very poor game design. (It’s sad that I can see more of the playing field in 800×600 Starsiege Tribes, a 14 year old game, than in 1024×768 Tribes Ascend). What’s really perplexing is the installation of DirectX 9 on my Windows 7 box. I realize the importance of Windows XP compatibility, but it’s a shame that the game can’t use DirectX 10 (which is already four years old). Still, that’s a very minor quibble. Then again, it perplexes me that the 2004 World of Warcraft (which also uses Direct X 9) looks much better than the 2012 Tribes Ascend, and can run at much higher settings. While the bread-and-butter of Tribes Ascend is Capture-The-Flag, there’s a handful of other modes that keep the game interesting. Team-Deathmatch is standard (although not as good as Gears of War 3) and the return of Capture-and-Hold is makes a very welcome come back. In fact, I’d argue that Capture-and-Hold is better than Capture-The-Flag due to the offensive focus of Tribes Ascend. Oddly, the Rabbit mode isn’t available in public servers, which is arguably the best mode off all. While the game modes are good, there’s nothing particular new or even evolutionary about them. Hi-Rez seems more interesting in copying old game types rather than thinking making anything new. 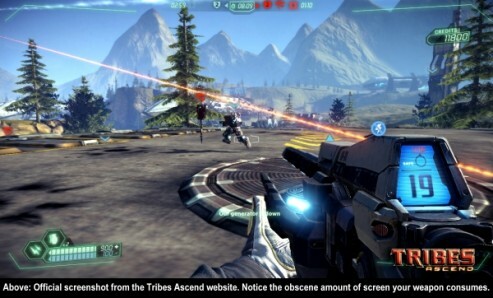 Tribes: Ascend is fun for basic fast FPS action or quick flag capturing. So if you’re just looking for a 20 minute game where you can login for free and get some points, Tribes: Ascend won’t disappoint. But a deep and balanced game isn’t in the cards. You definitely won’t get bored with it like Modern Warfare or Call of Duty, but it would certainly be more interesting if playing other classes had actual meaning. And it’s pretty frustrating when you have to quit early and realize you won’t be awarded any of the XP you earned. Overall Tribes: Ascend is a nice (for a free FPS game), and the servers seem to be very populated at this time. 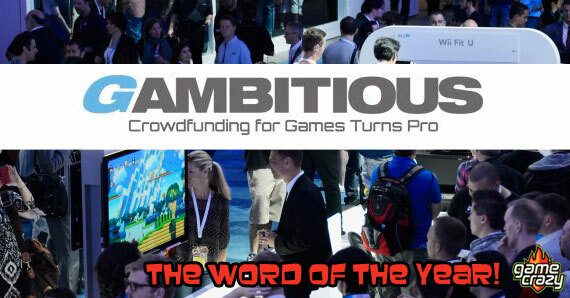 As a mindless shoot-em-up with fast flying it can’t be beat, but don’t look for any sort of deep game play. The game puts far too much emphasis on offense, the maps are uninspired, and the horribly broken Infiltrator (stealth) class just makes no sense in the game at all. I really wanted to give Tribes: Ascend a higher grade, but it’s just too one dimensional, and the completely broken Infiltrator class makes it downright unpleasant. 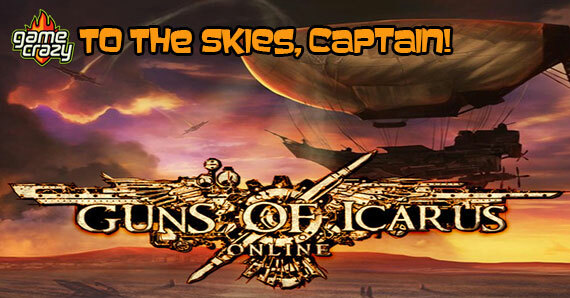 This entry was posted in Review, The GC Blog and tagged Gamers, Gaming, PC, Reviews, Tribes, Tribes Ascend, video game reviews by TheLe. Bookmark the permalink.